Trained and eager to help. Our inside and outside sales staff averages 25 years of service. Sizable inventories are stocked to readily fill our customer needs in a timely manner. Four delivery trucks circulating throughout Oregon and Southern Washington on a daily basis. We can source those “tough to find” items, arrange custom overlays, quote your cut-to-size requirements, or assist you in a myriad of other ways. 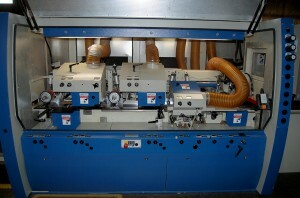 Ample equipment to maintain stock levels and minimize lead times on your custom profiles. Hardwoods or softwoods – no problem. 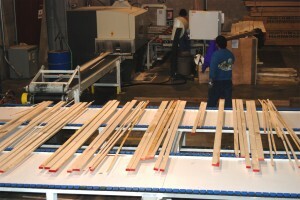 All standard and custom profile moulding knives are made in-house. Our computer-driven system provides extremely close tolerances. 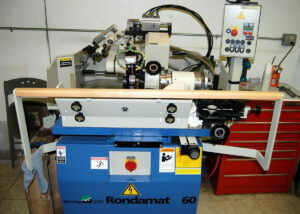 Scans and optimizes lumber for the most efficient cuts. Laser controlled for speed and accuracy.